For those new to Blur Busters, I am the co-author of a peer reviewed conference paper (along with researchers from NOKIA, NIST.gov and Keltek) on successfully photographing display motion blur which several websites have now adopted, including RTINGS, TFTCentral, SWEclockers, HDTVtest, etc. The most prominent site of these, RTING.com, credits me (here, here, and in the Credit Screen of the below YouTube) for my invention in inexpensively photographing display motion blur. Also, we were the world’s first consumer website to test a genuine true-480 Hz display (no fake Hz). We had to invent new motion tests to test 480 Hz. Here is a popular TestUFO Animation demo of motion blur from persistence (MPRT). Click on the animation for a bigger animation. The background looks different depending on which UFO you look at! For this optical effect, view this on LCD instead of CRT or plasma. If using motion blur reduction (e.g. ULMB, BFI, or interpolation), turn that feature off temporarily for this animation demo. Another great TestUFO animation is TestUFO Persistence-of-Vision. Warning for flicker-sensitive people: There are other animations further down on this page that utilize flicker to demonstrate scientific principles of display motion blur behaviour. These are two very different pixel response measurements. There are many 60Hz displays with <1ms GtG (e.g. OLED) but has 16.7ms MPRT (lots of motion blur). GtG is pixel transition time. GtG stands for Grey-To-Grey. Persistence (in milliseconds) is also known scientifically as “MPRT” in research papers (Google Scholar search). Quoted as a number, MPRT100% and persistence often mean the same thing by modern virtual reality scientists and newer display engineers. For example, Chief Scientist at Oculus, Michael Abrash, wrote a famous blog article that use the “persistence” terminology. This is because fast GtG doesn’t always mean fast MPRT. Back in 2013, I wrote “Why Does OLED Have Motion Blur?” when people were surprised by OLED motion blur despite OLED’s fast pixel response. This is due to the “sample-and-hold” effect, otherwise known as display persistence. Over the years, we did many tests (beginning with 60Hz vs 120Hz vs LightBoost in 2013, and most recently, becoming the world’s first website to test 480Hz in 2017). How Do Displays Reduce Motion Blur? 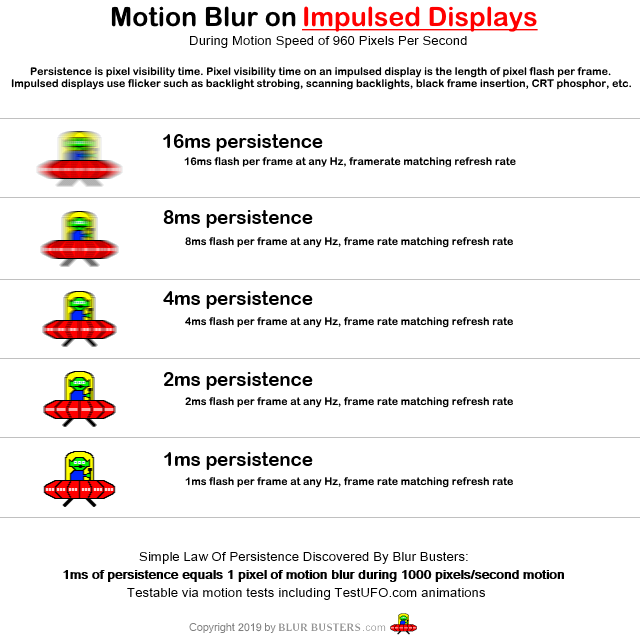 Motion blur on modern digital displays are reduced via strobing or black frame insertion (BFI) to lower persistence. Many LCD gaming monitors use strobe backlights (such as ULMB) that flicker at the same frequency of the refresh rate, in order to reduce motion blur. Also, OLED displays that do black frame insertion (BFI) tends to use a “rolling scan” technique (e.g. Sony Trimaster, Dell U3017Q, etc). Also, OLED screens used for virtual reality also do this type of rolling scan. This includes the Oculus Rift and HTC Vive, as well as Samsung GearVR compatible smartphones. 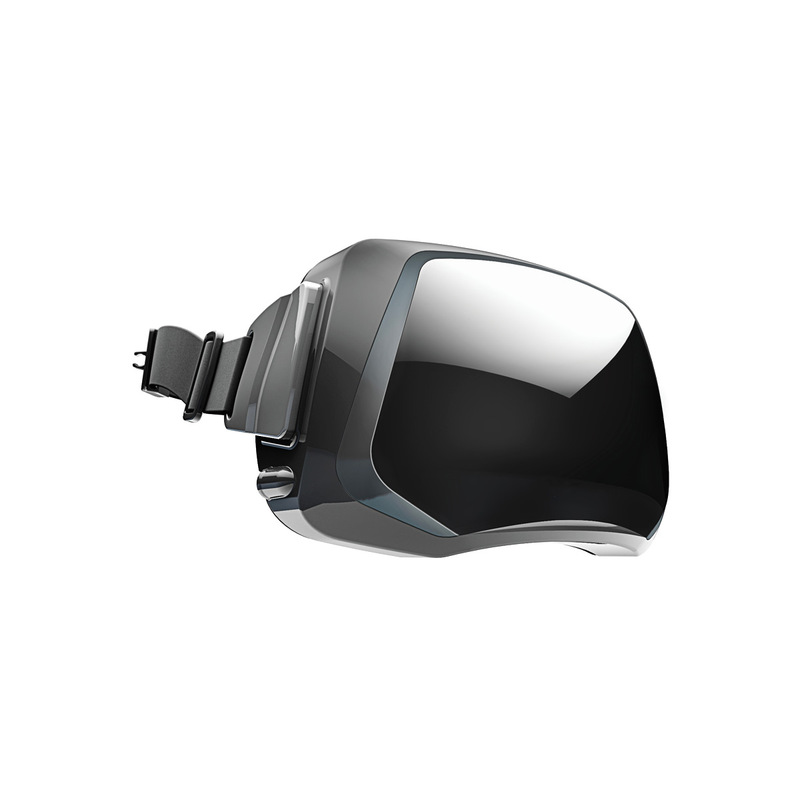 When a GearVR smartphone is inserted into a GearVR compatible headset, they run in a special low-persistence strobed mode. Many newer displays, especially OLED displays and modern TN gaming monitors, have the majority of their GtG pixel transitions complete in a tiny fraction of a refresh cycle. This makes GtG an insignificant percentage of MPRT. Such displays exhibit behaviour that closely follows Blur Buster’s Law. This is a universal guaranteed minimum motion blur that you will get on a display, no matter how good your vision is. This is before any addition blur is added, such as GtG limitations (additional smearing/ghosting) or display source limitations (camera blur or slow camera shutter) or human vision limitations (natural motion blurring). It is an immutable constant, similar to speed of light. This is the Blur Busters simplification of the MPRT formula found in this scientific paper. We use MPRT100% instead of MPRT90% (in the scientific paper). A 120Hz ideal sample-and-hold display has identical motion blur (MPRT100% = 8.333ms) as a 1/120sec photo shutter for the same physical panning velocity of full frame rate material. We prefer MPRT100% at Blur Busters for simplicity and to match human-perceived motion blur on fast sample-and-hold displays. This is also easier for blogs to calculate from TestUFO motion tests. This is easily demonstrated by measuring the amount of motion blur in motion tests such as TestUFO. Add black periods between frames: Black/blank/darkened gaps between frames. e.g. CRT/plasma phoshor, black frame insertion, strobe backlight, scanning backlight, pulsed OLED. Add extra frames: higher frame rates with individual frames displayed more briefly. e.g. Higher refresh rates for higher frame rates, either interpolated (faked frames) or non-interpolated. e.g. First interpolating 60Hz to 120Hz then strobing each of the 120 refresh cycles. However, software is limited in precision (erratic flicker) and can only BFI increments of full refresh cycle lengths. Hardware is required to achieve sub-refresh-cycle BFI (e.g. strobe backlights such as ULMB). Minimum MPRT equals one frame duration on sample-and-hold displays (full-persistence screens). Assumptions: The exact Blur Busters Law minimum is achieved only if pixel transitions are fully square-wave (0ms GtG) on fully-sharp sources (e.g. VR, computer graphics). Actual MPRT numbers can be higher. Slow GtG pixel response will increase numbers above the Blur Busters Law guaranteed minimum motion blur. Source limitations (e.g. slow camera shutter, video blur, unfocussed camera) also adds extra motion blur above-and-beyond the display. Minimum MPRT equals the pulse length on strobed/flicker/impulsed low-persistence displays. Assumptions: The exact Blur Busters Law minimum is achieved only at one square-wave flash per frame, during imperceptible strobe crosstalk. Frame rate matching refresh rate matching strobe rate. Any curves in the flash curve away from its peak level (e.g. CRT phosphor fade, plasma/DLP multi-pulsing, etc) will muddy the math (e.g. phosphor ghosting, rainbow blurs, etc). Very bad strobe crosstalk (GtG taking much longer that it overlaps two pulses) can also affect motion quality. What About Ghosting / Overdrive / Smearing Artifacts? These are additional blur-like artifacts above-and-beyond the guaranteed minimum motion blur mandated by Blur Busters Law. See LCD Motion Artifacts and LCD Overdrive Artifacts for examples. 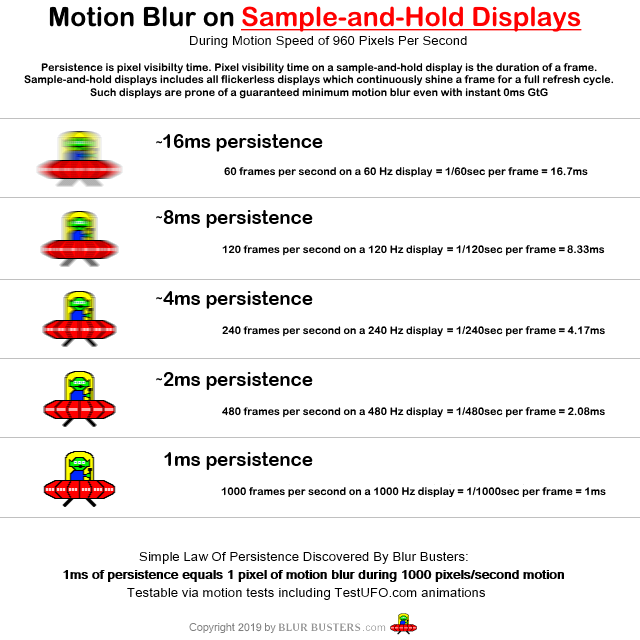 Blur Busters Law simply specifies the guaranteed minimum display motion blur you will see. It does not prevent additional motion blur (or other artifacts) above-and-beyond motion blur from persistence. Blur Busters Law still applies, except motion blur size is the stutter vibration amplitude instead. Just like a guitar string that is plucked, high-Hz strings are blurry while low-Hz strings noticeably vibrate. The same is true for display blur versus stutter — Blur Busters Law is simply a function of frequency. For low Hz where the Hz is so low, the normally high-frequency stutter no longer blends seamlessly into display motion blur. If you stare at www.testufo.com on a common 60 Hz LCD screen, you will see higher framerates tend to show motion blur while lower framerates tend to stutter (vibrate). Low frame rates such as 15fps (whether be 15Hz, 30Hz, 60Hz or 120Hz sample-and-hold) will noticeably stutter. Instead of “50 pixels of motion blur” it reads as “50 pixels of stutter amplitude” (the vibrate-back-and-fourth span). This is a TestUFO Animation that simulates variable refresh rate (G-SYNC, FreeSync, HDMI 2.1 Game VRR, or VESA Adaptive-Sync) via interpolation. Assuming you’re using a modern GPU-accelerated web browser (e.g. chrome://gpu fully green) the above browser animation above will show that low-framerate stutter blending seamlessly into motion blur as the frame rate (refresh rate) smoothly ramps up and down. A huge purpose of variable refresh rate gaming displays (G-SYNC and FreeSync gaming displays) is to eliminate stutters induced from frame rate fluctuations. However, it cannot fully eliminate stutter of ultra-low frame rates (e.g. 15fps or 30fps). Whatever leftover stutter remains, exactly follows Blur Busters Law except that the calculated minimum motion blur (in pixels) is instead the stutter amplitude (in pixels). The threshold blending between stutter and blur will vary from human to human based on their individual flicker fusion threshold on the stutter vibration. Blur Busters Law for high frame rates (240fps) will tend to be motion blur due to ultra-fast 240Hz “stutter” blending into motion blur. While Blur Busters Law on low frame rates (15fps) will tend to be stutter amplitude instead of motion blur. What About Duplicate Images on Strobed Displays? In the old days, playing 30 fps games on a 60 Hz CRT created a double image effect. This is still a problem today when playing on strobed displays running any frame rates below strobe rate. There are always 2 duplicate images during [email protected] strobed, and [email protected] strobed. This is still visible even at [email protected] strobed. In addition, multi-image artifacts are also made visible via backlights utilizing PWM-dimming, such as doing 360 Hz PWM at 60 Hz. This produces the same effect. While human eyes cannot detect high-frequency flicker directly, humans can still see stroboscopic effects and persistence-based motion blur from Hertz limitations. Duplicate image separation shrinks at higher Hz. However, higher resolutions and faster motion speeds, re-amplifies multi-image artifacts again. Not just from refresh rate, this can also include PWM backlights that flicker multiple times per refresh cycle (e.g. PWM dimming too). To do proper motion blur reduction, you want only one want one flash per frame. But I Also See Stroboscopic Effects at Full Frame Rate Too! This happens when you do fixed-gaze situations. This is also called the Phantom Array Effect. Stare at the middle of the below animation, the TestUFO Mouse Arrow Demo. Adding artificial motion blur (GPU blur effects) or camera motion blur (slow shutter) can fix this stroboscopic effect. Unfortunately, there are many situations where we don’t want motion blur forced upon us by the display above-and-beyond natural human vision blurring. This includes virtual reality headsets. Oculus and other manufacturers found that low-persistence reduces nausea in virtual reality. They cannot add additional motion blur without increasing nausea. So stroboscopic effects are currently the lesser of evil for most people. 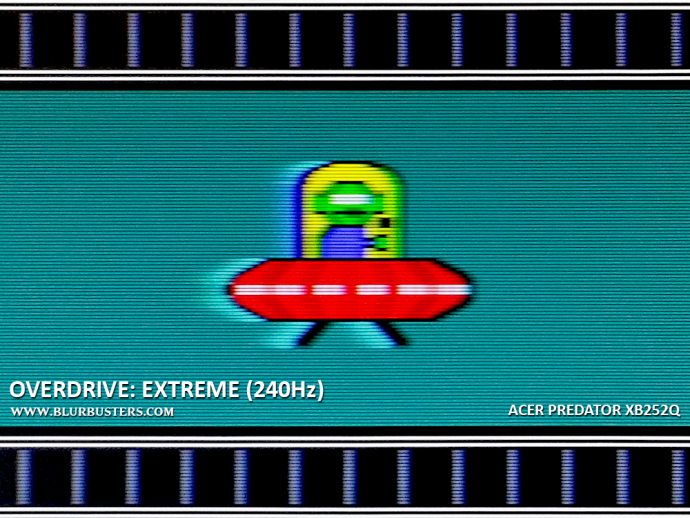 During our true 480 Hz monitor tests, stroboscopic display effects were still visible even at 480 Hz! Do Strobed LCD/OLED Flicker More Than CRT and Plasma? At lower refresh rates such as 60 Hz or 75 Hz, amplified flicker can occur because of the flicker curve and flicker duty cycle. On CRTs and plasmas, phosphor gives a gentler fade than square-wave strobe backlight flashes. In addition, global flash strobing (e.g. ULMB) also varies average picture brightness more than a scanning flash (e.g. CRT). This is why the equivalent refresh rate (e.g. 75 Hz) flickers a lot more on strobed LCD displays than on CRT/plasma displays, because you’re comparing square-waved strobing (e.g. ULMB) versus curved strobing (e.g. CRT). Today, we sit closer to screens that are bigger and brighter than yesterday’s CRT tubes. This amplifies visibility of flicker. Due to this, most blur-reduction modes (ULMB) run only at higher refresh rates such as 120 Hz instead of 60 Hz to avoid bad flicker. We simply use use overkill BFI/strobe rate to compensate for the lack of flicker curve-softening (phosphor fade). Thankfully, 120 Hz square wave strobing (ULMB or LightBoost) still flickers a lot less than an old 50 Hz or 60 Hz CRT. The only way to simultaneously fully fix motion blur and stroboscopic effects is an analog-motion display. Real life has no frame rate. Frame rates and refresh rate are an artificial digital image-stepping invention of humankind (since the first zoetropes and first movie projectors) that can never perfectly match analog-motion reality. However, ultra-high frame rates at ultra-high refresh rates (>1000fps at >1000Hz) manages to come very close. This is currently the best way to achieve blurless sample-and-hold with no flicker, no motion blur, and no stroboscopic effects. Also, real life has no flicker, no strobing and no BFI. Today’s strobe backlight technologies (e.g. ULMB) are a good interim workaround for display motion blur. However, the ultimate displays of the distant future will fully eliminate motion blur without strobing. The only way to do that is ultra-high frame rates & refresh rates. The limiting factor is human-eye tracking speed on full-FOV retina-resolution displays. As a result, with massive screen 4K TVs, 8K TVs, and virtual reality headsets, higher refresh rates are needed to compensate for degradation of motion resolution via persistence. the sweet spot for 1080p at 90 degrees FOV is probably somewhere between 300 and 1000 Hz, although higher frame rates would be required to hit the sweet spot at higher resolutions. Higher frame rates are definitely better for visual quality. They also are power hungry, so it will take a while to solve that for standalone HMDs. I think 240 Hz/eye is a good short term target and agree with 1kHz+ for the long run. Higher resolution displays: The same physical motion speed travels more pixels per second. This creates more pixels of motion blur for the same persistence (MPRT). Wider field of vision (FOV) displays: The same angular display motion speed (eye tracking speed) stays onscreen longer. This extra time makes display motion blur more easily seen. You need lower persistence to compensate: Increasingly bigger & higher resolution screens as time progresses, requires lower persistence (MPRT) numbers to keep motion blur under control. Display persistence is more noticeable for bigger FOV (bigger displays or virtual reality) and for higher resolutions (retina resolutions) due to bigger clarity differences between stationary & moving images. In the most extreme future case (theoretical 180+ degree retina-resolution virtual reality headsets), display refresh rates far beyond 1000 Hz may someday be required (e.g. 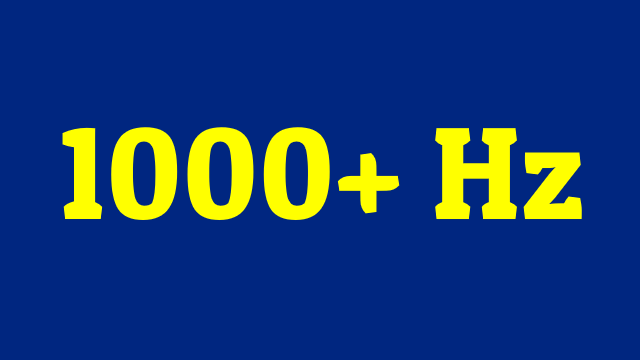 10,000 Hz display refresh rate, defined by the 10,000 Hz stroboscopic-artifacts detection threshold). This is in order to pass a theoretical extreme-motion “Holodeck Turing Test” (becoming unable to tell apart real life from virtual reality) for the vast majority of the human population. However, for general CRT-quality sports television watching, 1000fps at 1000Hz would sufficiently approximately match 1ms CRT phosphor persistence, for a flicker-free sample-and-hold display. Technologically, this is achievable through interpolation on an ultra-high refresh rate display. Blurfree Sample & Hold: Will 1000+ Hz Happen in My Lifetime? This will eventually be necessary for virtual reality, but also useful for huge wall-sized retina displays needing blur-free motion. It will take time, but fortunately, it is closer this century than many think. Experimental 1000 Hz displays now exist. 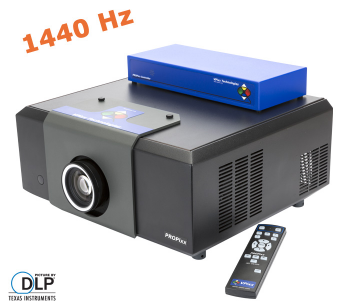 For example, ViewPixx has a 1440 Hz DLP projector for display research, and there are several other vendors. Indie/homebrew beat mainstream to 240 Hz in 2013, and to 480 Hz in 2017, as attested by our real-world tests of true 480 Hz. Beyond niche/indie manufacturers already selling ultra-high-Hz today, we currently expect mainstream-manufacturer 480 Hz gaming monitors to hit the market by year 2020, and mainstream-manufacturer 1000 Hz gaming monitors to hit the markets by year 2025. It will be challenging for graphics processors to generate the ultra high frame rates necessary for future 1000+ Hz gaming displays of the 2020s and 2030s. Solutions are being accelerated out of necessity by virtual reality research. For example, Oculus’ asynchronous time-warping and spacewarp technologies converts 45 frames per second to 90 frames per second at low GPU processing cost via clever 3D interpolation tricks. Dr. Morgan McGuire (NVIDIA scientist who agreed on 1000+Hz) wrote an article for RoadToVR about foveated rendering algorithms as well as real-time ray-tracing or beam-tracing with real time de-noising. This can be another potential alternative to ultra-high frame rates. In addition, future lagless 3D interpolation technologies with geometry-awareness and parallax-reveal capabilities, may potentially convert 100fps to 1000fps with no visible artifacts for 1000Hz. Another theoretical route to successful high-detail 1000fps+ could be a co-GPU embedded in the display (Imagine a G-SYNC 4 or FreeSync 4 with strobeless ULMB! ), working in conjunction with a main computer’s GPU, in order to get around display cable bandwidth limitations. The future of “Frame Rate Amplification Technologies” (FRAT) is full of exciting research! Update: PC Games Hardware (Germany language) has written about this article! I love your forum. I have learned so much about motion blur and my eye issues using led monitors. Interesting article. Hopefuly they find a method to simulate 1000FPS or even half that by the time they release those new monitors with such high refresh rate as otherwise it will be totally meaningless and just marketing bs to increase sale with no real difference for a gamer that isn’t playing a 10 years old game with a quad-sli of 1080Ti. Yes, that is the frame rate amplification technology challenge, which is being worked on in parallel. I’m starting to really get this. The motion blur from sample and hold comes from when your eyes track a moving object. So the longer the pixels stay lit for, and the faster your eyes move, the farther they streak across your vision creating motion blur. Just found out that there’s already a Christmas 2017 reddit thread in /r/pcgaming discussing this article. People have also apparently shared to /r/hfr and /r/osugame. Also, PC Games Hardware Germany also mentioned this article and has their forum thread (in Germany language).